"We serve the best burgers, pizza, and chicken in town!" Some come for the thin crust pizza, others for the broasted chicken. But my favorite food at Clancy's is the California burger with cheese and a slice of raw onion, yeah. And all washed down with a frosty mug of cold draft beer. 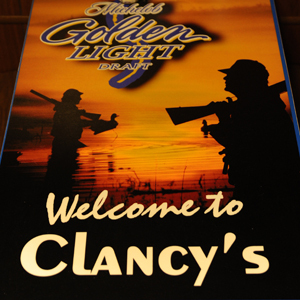 For more information, you can call Clancy's, like us on Facebook, or contact Randy.